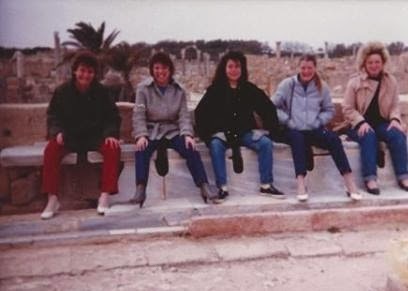 On Thursday 8th March 1984, just ten days after I arrived in Libya, a group of AGIP secretaries enjoyed the pleasure of a day-trip to Sabratha to visit the ruins of an ancient Roman city of archeological interest (a UNESCO World Heritage Site since 1982) about sixty kilometers to the west of our villa in Tripoli. I have no memory of who arranged the excursion and to my knowledge, I never thanked anyone for their consideration. It was probably Pietro Cavanna, the director of production and offshore development, whose secretary, Elizabeth (whom he called "Betty") was one of our party. With the over-confidence of a middle-class westerner, or perhaps it was the innocent optimism of youth, I took for granted that this was to be the first of many day-trips I would be offered. Betty, an easily flustered, highly strung Scotswoman who'd been in Tripoli for donkeys' years and was older and wiser than the rest of us (in her late fifties, I guessed) was quick to quash that idea. "I shouldn't build up your hopes, if I were you," she warned with what I attributed to simple Scottish pessimism, "we'll not be doing this often." "Och, so very difficult to get things organized," she answered. "It takes a lot of time and effort to get anything done here. You wait and see." "This is a treat," Jean chimed in. "First time we've done anything like this since I've been here!" "I was hoping to visit Leptis Magna. I'm sure we can arrange a trip there," I declared with assurance, as if I had the slightest clue of what I was talking about. "Well, we'll see," Betty said. A shake of the head and a wry smile. She turned to gaze out of the window. Since this kind of outing was the very thing I'd hoped to experience as "a world traveler" -- I had inherited a love of history from my mother and was a bit of a fanatic -- I was not to be convinced. I didn't know then that Betty was right, that it was indeed a one-off, that life in Libya was going to change radically very soon afterwards and make such expeditions all but impossible. The weather that day was awful, as it can be along the Mediterranean coastline in early spring; windy and cold, it rained all the way. Looking out of the minibus windows, it was hard to distinguish even the outlines of the passing scenery, such as it was. "Typical!" we cried, as English people always do on rainy outings to the seaside, "Just our luck!" I was fairly sure that by putting my sunscreen in my bag, I had brought on the bad weather myself. I so rarely used sunscreen that the very act of carrying it was like the kiss of death for potential sunshine. In fact, it rained so hard that particular day, there were floods in and around Tripoli, turning the romantic Saharan sand into a thick, unromantic mud. I wore jeans, two sweaters and a pea coat, and I kept my gloves on the whole time. I wished I'd been less dismissive and brought wellington boots with me from England as had been suggested by Freddie Rothwell. I'd poo-poo'd the idea as being ridiculous, "Wellington boots in the desert! I've never heard of such a thing!" I am a sad-and-sorry case for learning from experience. However, in spite of the ghastly conditions, which did improve marginally as the day went on, these stoic British lady tourists -- Lindsay, Jean, Yvonne, Sally, Betty and I -- were determined to enjoy themselves. I vividly recalled Sabratha being mentioned by one or two of the Latin prose writers I studied in the fifth form at Winchester County High School and was excited beyond measure to have those writings brought to life. I was prepared to be enthralled! There was a little museum at the main entrance. We found on the counter one dog-eared copy of an old guide book that looked as if it was as ancient as the site itself. Alas, it wasn't for Sabratha; it was for Leptis Magna and dated 1957 which was good in one way because, being pre-Gaddafi, there was an English translation for the Arabic text; but bad in another: there was nothing, not a dicky-bird, to tell us about the site we were actually visiting. The museum was deserted, not a curator or tourist in sight. Its displays were dismal, covered with dust, and impossible to follow because the labels were printed in Arabic. Colonel G, in an effort to create a true Arab society, had requested, nay, demanded, that documents connected with Libyan culture, indeed all Libyan documents, be written only in Arabic with no translations into any other language. This naturally added a level of difficulty to interactions between Libyan locals and expatriates. While we were not encouraged to learn Arabic -- actually, we were officially discouraged -- Libyans themselves, especially our office workers, seemed to appreciate our conversational efforts. I learned how to say, “A salaam alaykum," a generic greeting which sounds like "Salama Lycoom” and means, "Peace be with you." And “Good morning!” which is, "Sabah el kheer" (when I said it, it sounded like "Sabakeer!") I learned "Ahlan!" which is "Hello!" and “Thank you!” which is, "Shokran" (sounds like “Shoocoran”) and "Marhaban!" meaning "Welcome!" Among the expatriate community, I was quickly taught "I.B.M.," a humorous acronym standing for “Insh’allah,” “Bucra,” and “Malesh.” “Insh’allah” means “God willing,” “Bucra” means “tomorrow,” and “Malesh” means “Never mind!” I.B.M. was a kind-of code for what was generally considered, tongue-in-cheek, the Libyan attitude to expatriates. Whatever you wanted, you would get it “Insh’allah” -- if Allah were willing. But you definitely wouldn’t get it today, come back "Bucra" -- tomorrow. And when you’ve been back every day for a month and still haven’t got it, you may as well put it out of your mind because you’re not going to get it. "Malesh!" -- Never mind! I guessed this was what Betty was talking about when she said, "It takes a lot of time and effort to get anything done here..."
Even in the cold, the wind and the showers of that grey day, the ruins at Sabratha were spectacular; but when, eventually, the rain ceased and the skies cleared briefly, we were blessed with the opportunity to see the incomparable beauty of the place. Without wanting to sound corny, it took my breath away. I had a distinct sensation of time passing and yet standing still, as if I were in the past and present simultaneously. My mum called that feeling, "a sense of history," as if all eras of life could exist at the same time. When I closed my eyes, I could imagine the town bustling, functioning, thriving. I could picture chariots racing by; camels and caravans arriving from southern parts of Africa, their goods being unpacked for the locals; ships with striped sails heading north to Italy. I had the sensation that I could almost reach out and touch the inhabitants of this fascinating town. As I trod those antiquated stones, I "sensed the history," just as my mother described. I felt like I was a tiny speck of nothingness in the broad picture but a significant part of the moment. "People have been walking on these stones for thousands of years," I thought, "I'm walking on them now. I'm a living part of history." We found a line of latrines, a sort of public lavatory, which seemed to be the remaining ones of a ring of sit-down toilets (pictures on the internet suggest it might have been octagonal rather than circular but we had no such data at the time). We supposed Sabrathans would sit on the various loos, read their newspapers, and chat about the day's events while having a poo. Horrifying! We were suitably entertained by this, giggling like silly schoolgirls, so I asked my friends to choose a toilet, sit herself down and I posed a photo which Betty was happy to take. "Gosh, that would be a Nason nightmare, wouldn't it?" I wrote to my mother. "No one in our family would never be able to 'go' again!" I should add at this point that, although the museum was deserted, the archeological site itself was anything but. Oh, there were no tourists, no coach parties, no knowledgeable guides. Presumably from the modern village of Sabratha, approximately one million young Libyan males, from small boys to grown men, tagged along as we wandered about. Okay, okay, I'm exaggerating, the number was more like thirty but really, that's a lot of desperate males in one place at one time. They pursued, pestered, and goaded us; if one got close enough...they pushed each other constantly...he'd whisper in a provocative way. You would have thought we were aliens from another planet, and I supposed in some ways, we were, at least to them. The aggression was overt though I doubt the youngsters were aware of how frightening it was for us. They may have thought we'd be flattered; we weren't. If the dreadful weather had already put a damper on the day, these young men certainly drained any remaining enthusiasm. By the time we made our way to the minibus, we were exhausted by the chase. On the way home, the younger woman in the group discussed the "do" we were attending that evening, a "Sports Wear" party. It was my first real social event (other than a darts evening) and I was looking forward to being a girl and meeting some boys who didn't think of me as an object of lechery and misplaced anger. My fingers were firmly crossed. I had hoped to be able to tell my mother "all about Sabratha" but I had no facts to pass along. As a matter of fact, when I wrote to her the following week, telling her of our adventure, I closed it with, "You'll have to find out about Sabratha for me, rather than the other way round...I'd very much like to know more about Tripoli and the goings-on here, ancient and recent, so when you have a moment, perhaps you can do some research for me."